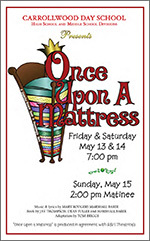 Carrollwood Day School presents the “Once Upon a Mattress.” Come with us to a faraway medieval kingdom and join in the search for a proper bride for the Prince of the land. This rollicking spin on the familiar classic, "The Princess and the Pea," provides for some side-splitting shenanigans. Chances are you'll never look at fairy tales quite the same way again! The cast for this production is made up of 29 talented students from CDS middle and high school divisions. This production is led by the "Dream Team" - Colleen McEvoy, high school performing arts teacher, Michele Crimella, middle school performing arts teacher and Amy Callahan, middle school music teacher! Ava Gionis ('21), Matheson Woeste ('21). Enjoy 115 of the director's favorite pictures!